Grenade at Work! Is this funny? When I first saw this bad boy I thought first of the fire drills we used to have in the dorms at the University of Arizona. Man they where loud and there was no way to sleep through them. The Ear-splitting “sonic grenade” brings out the same affect. 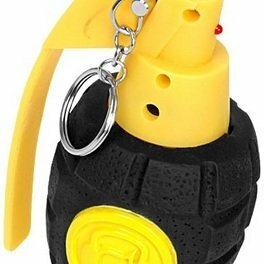 Simply pull the pin, and launch the grenade into the target’s room. In ten seconds a very annoying and piercingly loud noise (one of three volume settings) will blast out from the alarm. The best part is that to stop the alarm the sleeper has to find you so you can put the pin back in. Now that’s annoying. A great prank toy or a great travel gadget for getting your family going on those early mornings no one wants to get up. Pick one up for $16. Read about what I do for groups looking for more Humor in the Workplace here! https://www.bradmontgomery.com/wp-content/uploads/2018/11/logo-1-495x198-1-300x120.png 0 0 admin https://www.bradmontgomery.com/wp-content/uploads/2018/11/logo-1-495x198-1-300x120.png admin2006-01-13 17:04:252006-01-13 17:04:25Grenade at Work! Is this funny?